One of my favorite parts about Fall is all the yummy produce! 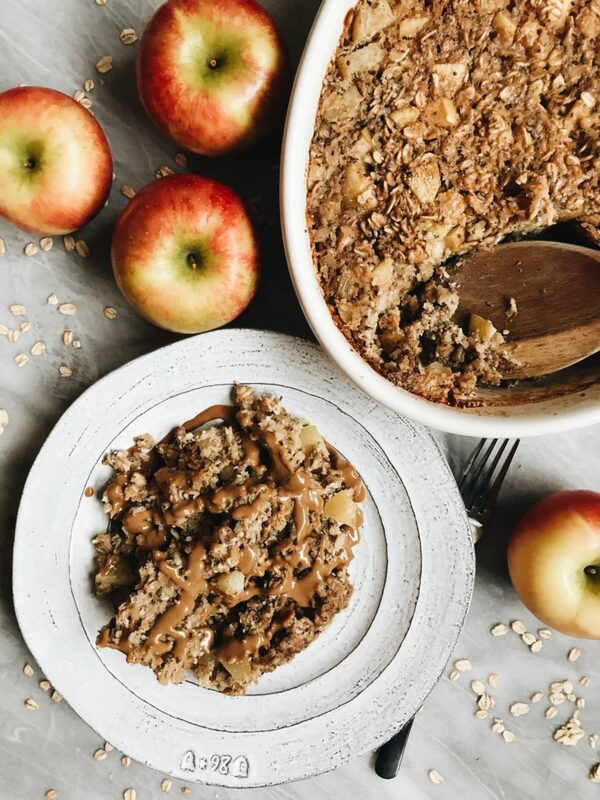 Enjoy this delicious Apple Pie Oatmeal Bake using one of the best fruits from Fall time: Apple’s! Made in partnership with Bob’s Red Mill. During the Fall time, you will catch me snacking on apples 24/7. I buy honey crisp apples by the bag weekly. They’re absolutely delicious and I love to create different ways to use up all the delicious local apples while I can. 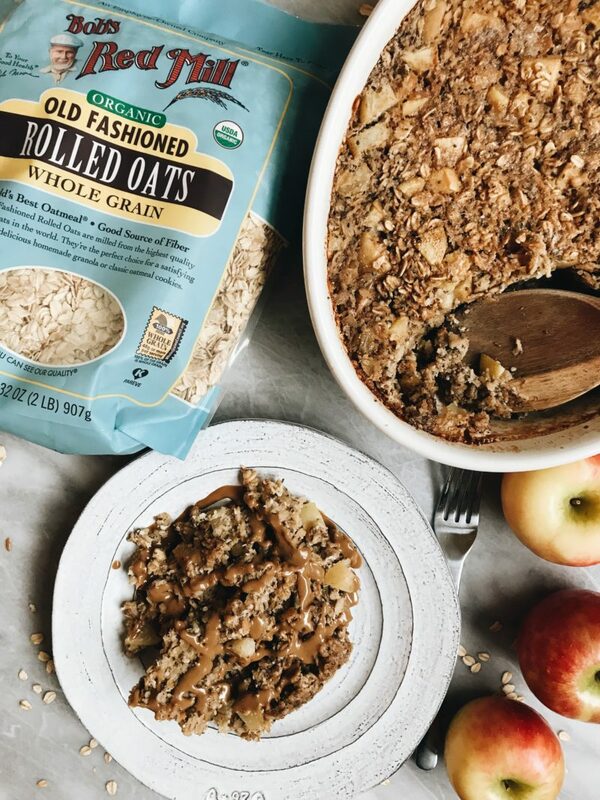 I love oatmeal bakes because not only are they great to serve to a large group of people, but they’re also great for meal prep. Divide this up for the week and reheat later by adding a touch of your favorite plant milk. 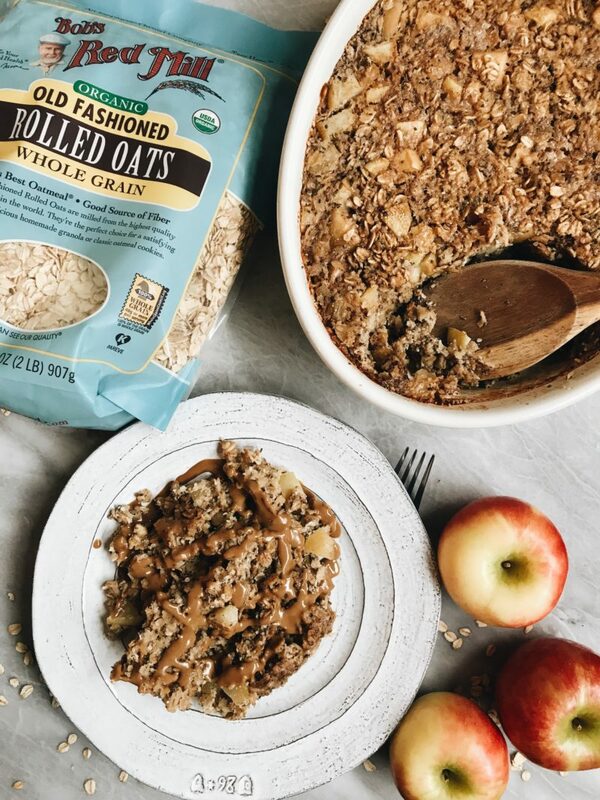 I absolutely love apple pie, so I was super excited to play up on those flavors by creating this delicious baked oatmeal. 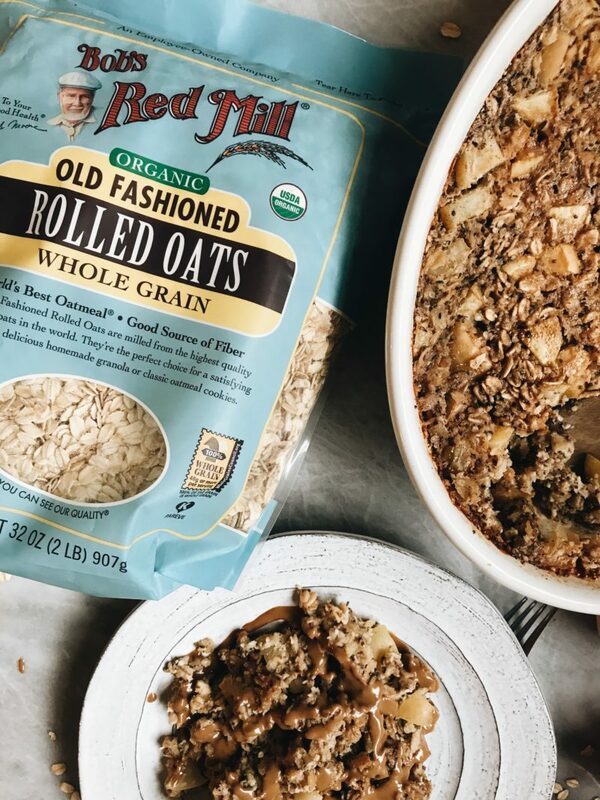 The key for this recipe to work is by using old fashioned rolled oats. Instant or steel cut won’t work for this recipe. I used the Bob’s Red Mill Old Fashioned Whole Grain Oats. I use Bob’s Red Mill all the time in my daily life. Whether it’s using their flour for baked recipes or coating tofu to make it extra crispy, nutritional yeast to make my dishes extra cheezy, or their pearled couscous for a fun twist in many of my daily meals. They’re my go to for SO many products and it’s really amazing how much they have to offer. All of their products are vegetarian with MANY of them being Vegan, so they’re always first on my list for anything that I may need. I also don’t have to find them in a specific grocery store, they’re always at my regular good old store. If you want your kitchen to instantly smell like Fall, this is the perfect recipe for you. My apartment smelled like a baked apple warehouse (which just isn’t a thing but let’s pretend it is) and I was just SO down for it. 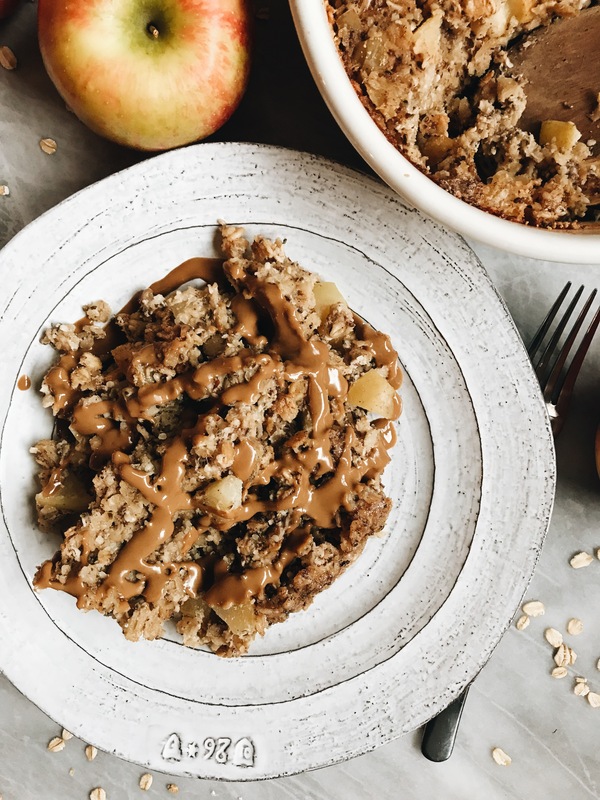 I served my apple pie oatmeal bake with a drizzle of sunflower butter. However, you can have it with some nice maple syrup, plant milk, or some vegan whipped cream (which sounds delicious). Recipes like this are what make me appreciate this time of year. Fall has always been my favorite season because it’s cozy, cold, and watching the leaves turn stunning colors is truly amazing. However this recipe adds on to the cozy aspect of Fall, and helps warm you up as the temperature changes. I hope that you enjoy this recipe! If you make any of my recipes, don’t forget to tag me on Instagram @plantbasedjane. Begin by pre-heating your oven to 350 degrees Fahrenheit. Chop up your apples and add them to a bowl with a squeeze of lemon juice. 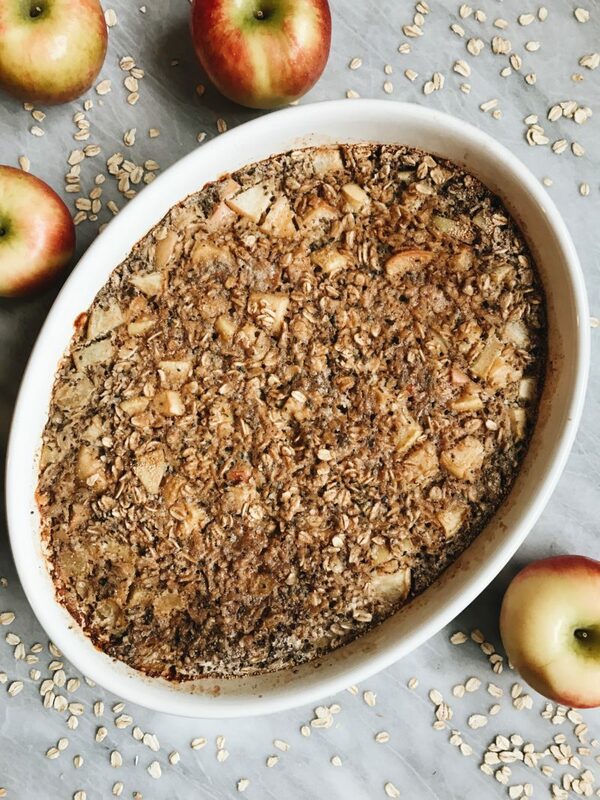 In your 9x9 baking dish, combine your oats, baking powder, cinnamon, salt, hemp seeds and chia seeds. In a bowl combine your flax eggs, plant milk, maple syrup and vanilla extract. Mix well with a whisk making sure that everything is well combined. Add your wet ingredients into your baking dish and whisk to combine. Add your apples to the baking dish and mix around with a spatula. Cover with tinfoil and let bake for 50 minutes. After 50 minutes, remove your tin foil and let cook for another 20 minutes. Remove from oven and let sit up to 10 minutes. Serve! Thank you to Bob’s Red Mill for sponsoring this post. It means a lot to work with brands I love and support my blog!